One initiative that came out of the H.E.A.T. Collective is ARUNY. 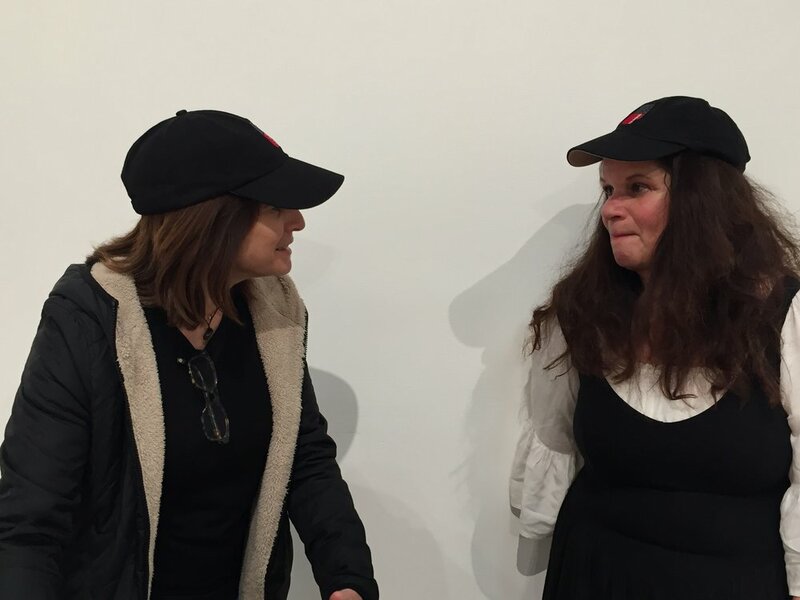 The company was born on November 9th, 2016 with ARULA (ARTISTS RISE UP LOS ANGELES) when I spoke with my friend and colleague Sue Hamilton in Los Angeles, and we came together to create a bi-coastal artistic response to the 2016 Presidential Election. Although our missions are similar, the format for the two groups is quite different. I began having meetings at my house- I put the word out that any artists with feelings about the election, that felt the need to share and create in protest was welcome. The meetings were large and often emotional, and slowly we began to carve out an idea for a first event. We produced five theatrical events in its first year. About 20 people were involved in our first performance and production, as the year progressed a core group of 5-6 people became the main contributors to the meetings and the backbone of the productions. Artists Rise Up New York's purpose is to create Performative Actions for Justice, and Peace. Our intention is to create positive, social and revolutionary action by bringing our creative minds, our wounded hearts, our righteous fury and our collective strength to the process of making art for change. We did this by focusing on creating events that include audience engagement. I remember in our post show discussion after The Rising a female minister was expressing her concern about officiating at a wedding in a red state where the families had voted for Trump and a gay man sitting a couple of rows behind her encouraged her to go as he had just had a breakthrough with his conservative family. He offered to supply support calls and they exchanged numbers. In The Landing audience there was a weeping mother of a school age child expressing her woes about raising a child in the time of climate change and everyone began crying with her. After The Divide the audience each offered a pledge to take an action towards peace and justice. The audience and actors took a shared bow for the work we’d done together. 1. The audience enters an immersive carnival of protest. Welcomed with refreshments and warmth, they are invited to engage with interactive installations. 2. A welcome to the audience by ARUNY. Ryan Little Eagle Pierce offers a blessing over the Lenape land which New York now occupies. ARUNY’s first performance in association with La MaMa and The H.E.A.T. Collective includes The Fear Project, created by Jessica Litwak, The FEAR Project is an ensemble piece based on interviews taken by the entire ARUNY community. 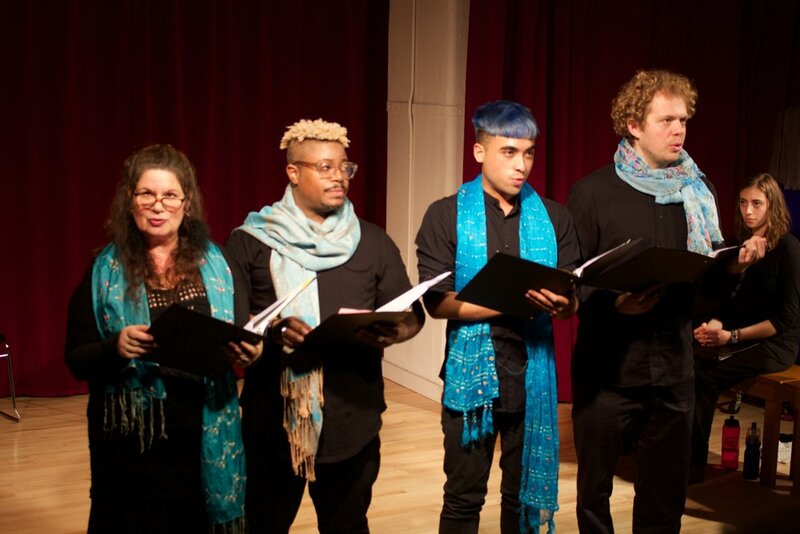 Telling stories about our collective and individual fears in our current climate it is a collage of choral poetry, monologues, songs, scenes and audience interaction performed by five members of our group. The piece has been created and performed in the Czech Republic and India. This new version will be the U.S. premiere. There will also be a carnival of activist actions, celebrations, and conversations and an interactive dance piece will also be presented as an effort to galvanize our energies and begin to create the physical momentum we need as a community. A wall of concerns: What concerns you most about Climate Change? Divided into four parts: 1. Climate justice, 2. water and air, 3. earth and trees, and 4. animals. With post-its and markers nearby to write out the nature of your concern. The exhibit included reports, facts and art pieces about all four areas. There was a spirit animal wall: write and/or draw your spirit animal, and a selfie station with endangered species puppets, and of course food (and wine). Artists Rise Up New York (ARUNY) is sponsoring the official culminating event of Climate Change Theatre Action (CCTA) on November 18th at 7pm at The Lark in midtown Manhattan. The Landing book-ends The NYC Launch, which kicked off CCTA seven weeks ago. The evening will celebrate the 100+ theatre events that have taken place in over 30 countries and almost 50 US states since October 1st. The NYC Landing will present readings of animal-themed CCTA plays, and speakers from animal rights groups will report on how climate change is affecting the animal kingdom. The plays will be directed by members of ARUNY. Audiences will have the opportunity to take local action on climate issues, as we share in a spirited environment, featuring visual climate artworks. The evening will culminate with conversation and refreshments. A wall of Hands: audience was asked to outline their hand on large paper and write a hope for the divided world inside it. Audience were given either red or blue tickets- depending on your color you had to enter the exhibits t your left or to your right. A booth where audience members could go 1-2 at a time with a moderator and speak to a Trump voter on the phone- asking questions about why he voted for Trump. He could also ask them questions. The Divide, an anniversary evening of performance and dialogue from Artists Rise Up New York (ARUNY). The event is free, though donations will be accepted at the door, and all are welcome. One year ago, ARUNY presented The Rising, in response to the presidential inauguration. This year, we reflect on what has happened in the first year of this administration, and hold space for questions, fears, and hopes as we strengthen our community in support of the most vulnerable among us. The Divide is an evening of readings on specific, divisive issues of our current moment. The event includes interactive installations for audiences to share their perspectives and take local action. 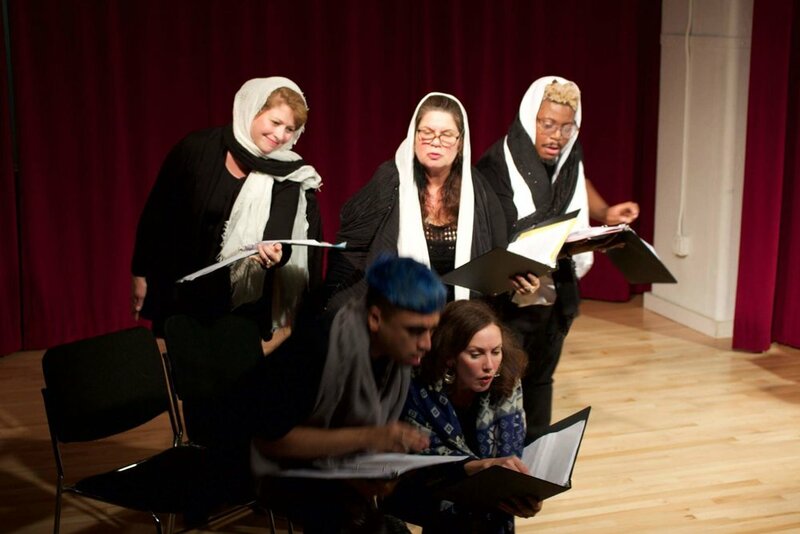 The Divide is comprised of the following play readings: The Bridge by Jessica Litwak is a comedy about the effects on a long friendship of political divisiveness in the United States; The Wall, written and performed by Jessica Litwak, is about the conflict in Israel and Palestine. Having crossed through the checkpoints many times, Litwak has a unique perspective on the Occupation and this human rights crisis. As an educator and theatre artist who has worked in Jenin, Hebron, Ramallah, Beit Jala and Nablus in the West Bank and who has deep relationships in and with Palestine she cannot support or condone Israeli actions. As a Jewish woman in the Arab world she grapples with the deeply felt paradoxes of heart and heritage, east and west, justice and peace. This short play uses poetry, humor, puppetry and diverse characters to give voice to an impossible problem that can only be survived through increased humanity, paradoxical curiosity, and artful expression. Dream Acts is about immigration and undocumented youth. It is collectively written by Mia Chung, Jessica Litwak, Chiori Miyagawa, Saviana Stanescu, and Andrea Thome. In Dream Acts, five undocumented students from Nigeria, Mexico, Ukraine, Korea, and Jordan relate stories of their extraordinary challenges in living ordinary lives under the Homeland Security radar. Each story is moving and urgent; some are funny, others are tragic, and through their experiences, we learn about the DREAM Act and the secret lives led by undocumented students. The evening will culminate in a community-oriented conversation, with guests from the field of conflict resolution and immigration, including Matthew Covey of Tamizdat, Yonit Friedman of IfNotNow, and more. Our first year was an inspiring collaborative experience. We worked collectively from the inception of an idea (always inspired by a circumstance in the county or in the world that we felt needed addressing) to the production. It got us (and our audiences) through the first year of the Trump administration. After the first year, most of the core group felt that they could no longer give so much of their time and energy to this volunteer artistic effort. But I hope to keep ARUNY going and to Rise Up theatrically in protest for Gun Control, Climate Change, Immigration Rights, Human Rights, Animal Rights, Women’s Rights, and more. Until the next ARUNY initiative, The H.E.A.T. Collective will carry on the work of protest theatre. You can check out ARUNY here: www.aruny.org.